My freezer has somehow accumulated a long winter’s worth of odds and ends. (At least half of it is stuffed full of breads…cornbread, sourdough, biscuits, dinner rolls…) Digging around in it, trying to locate missing black bean chili I swear I stashed away back around Christmas, I spied a package of ground lamb and several merguez sausages I have no memory of buying. Unearthing these freezer surprises sent my cravings off on a Mediterranean tangent, and I decided to bake some made-from-scratch pita bread while grilling lamb patties. 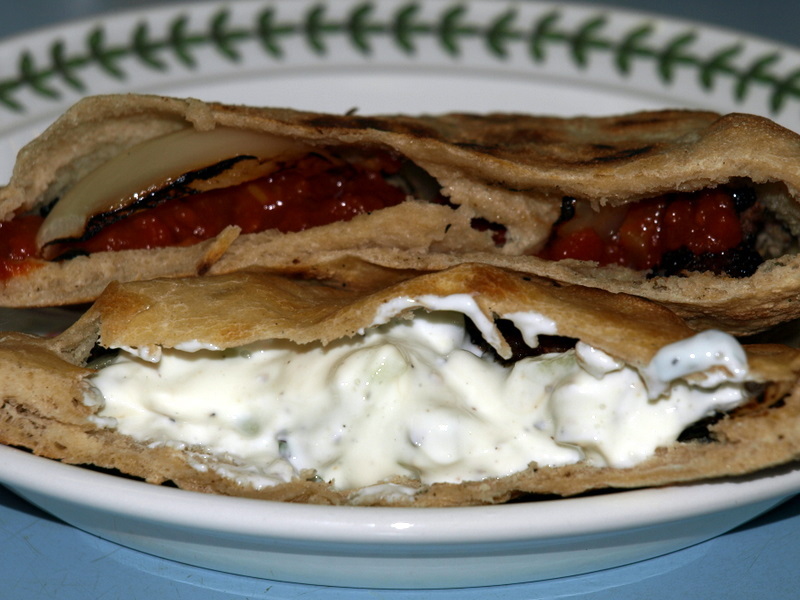 Any surplus pita would be pressed into service for the upcoming grilled merguez. The combo was inspired by the success of my tandoori chicken wings + naan cooked simultaneously on the Big Green Egg. As it turns out, a baking stone heated to 650 degrees by a charcoal fire is ideal for baking various flatbreads. 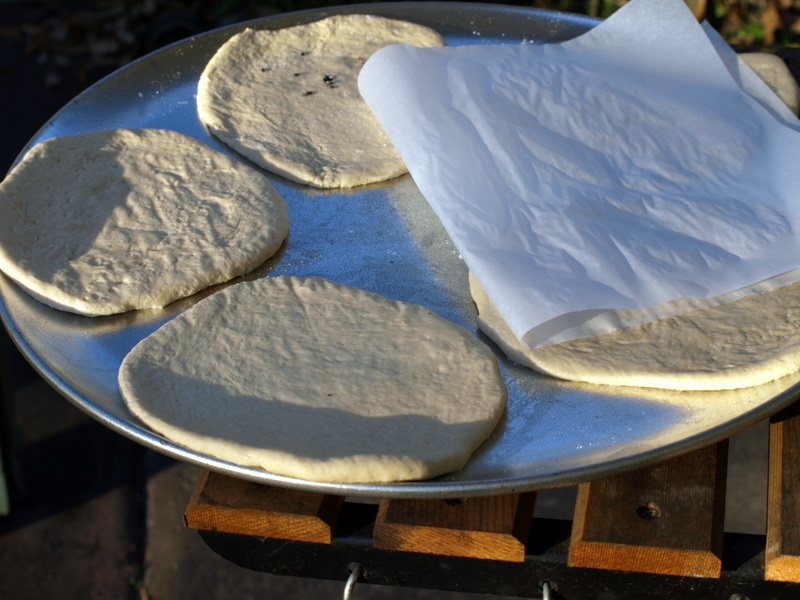 The part whole-wheat pita dough (p. 181 in Alford & Duguid’s Flatbreads & Flavors: A Baker’s Atlas,) was easy to make, incorporating a simple sponge and less than 10 minutes of kneading. Shaping and baking proved simple enough; I quickly learned that thinner rounds puffed better than thicker dough blobs, and a quick flip halfway through ensured an evenly browned crust. The dough even improves in flavor if refrigerated for several hours or up to four days. Just pinch off small amounts of refrigerated dough to bake as needed, allowing the dough to rest at room temperature for at least an hour before rolling). Plain pita and lamb seemed a bit dry, so I concocted a simple yogurt dressing (greek yogurt, lemon juice, finely diced cucumbers, chopped fresh mint, and ground black pepper) and a spicy tomato sauce (whole cumin seed & minced garlic browned in olive oil, then simmered with red pepper flakes and crushed tomatoes until slightly thickened) to garnish the pocket sandwiches, along with grilled onion chunks. I’m still searching for the damn black bean chili; maybe I gave it away? 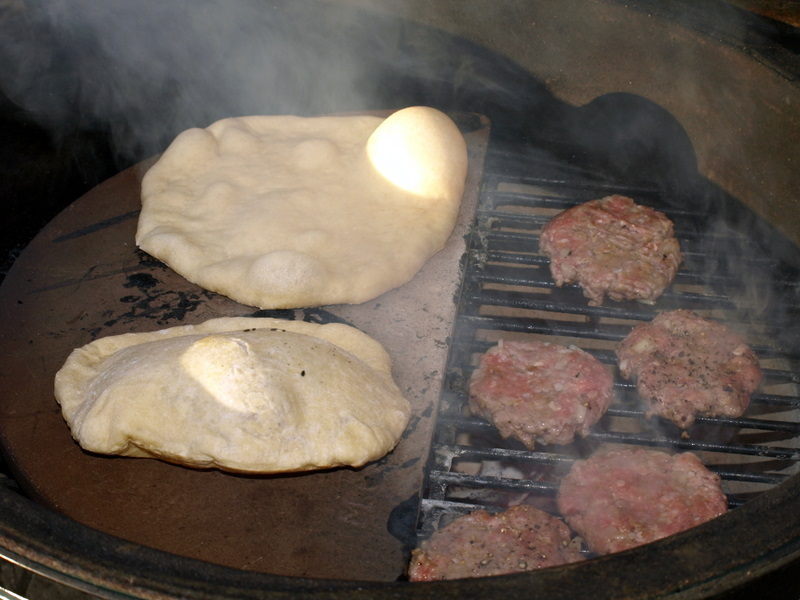 Pingback: need advice on using the Big Green Egg smoker/grill?